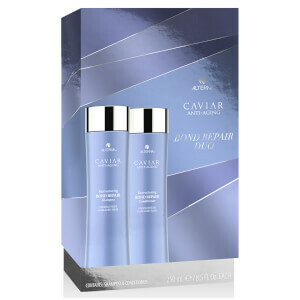 A portable 4 piece set of Caviar Anti-Aging products that instantly transforms dull, damaged hair. Includes Overnight Hair Rescue, an intensive overnight treatment that repairs your hair while you sleep. Perfect for weekend getaways, the gym or as an introduction to the CAVIAR line. 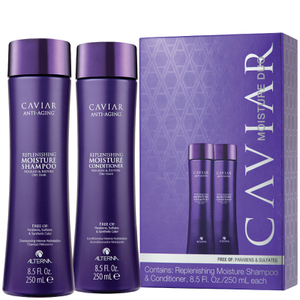 Sulfate free shampoo provides hydration to moisture-starved hair. 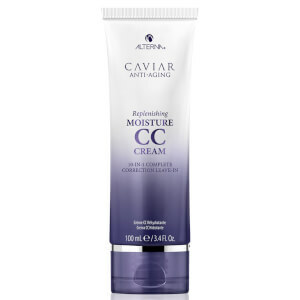 Nourishing conditioner that hydrates while protecting from damage. Intensive overnight treatment that repairs hair while you sleep. Provides humidity resistance with a flexible hold. No parabens, phthalates, mineral oil, paraffin, DEA, TEA, petrolatum or PABA. Shampoo: Aqua/Water/EAU, Sodium Cocoyl Isethionate, Sodium Lauryl Sulfoacetate, Disodium Laureth Sulfosuccinate, Cocamidopropyl Hydroxysultaine, Sodium Lauroyl Sarcosinate, Cocamidopropylamine Oxide, Decyl Glucoside, Lauryl Alcohol, Glycereth-26, Glycol Distearate, Amodimethicone, Wasabia Japonica Root Extract, Foeniculum Vulgare (Fennel) Seed Extract, Chondrus Crispus (Carrageenan) Extract, Hydrolyzed Algae Extract, Algae Extract, Caviar Extract, Linum Usitatissimum (Linseed) Seed Oil, Butyrospermum Parkii (Shea Butter), Helianthus Annuus (Sunflower) Seed Extract, Saccharomyces Lysate Ferment, Saccharomyces Copper Ferment, Saccharomyces Zinc Ferment, Superoxide Dismutase, Lactoferrin, Daucus Carota Sativa (Carrot) Root Extract, Retinyl Palmitate, Phospholipids, Corn Oligosaccharides, Copper Lysl Oxidase, Acetyl Methionine, Acetyl Serine, Amino Acyl tRNA Synthetase, Phytosphingosine, Ganoderma Lucidum (Mushroom) Tyrosinase, Lentinus Edodes Tyrosinase, Glycine Soja (Soybean) Seed Peroxidase, Peptone, Hydrolyzed Soy Protein, Glycine Max (Soybean) Symbiosome Lysate, Pikea Robusta Extract, Adenosine Triphosphate, Niacinamide Polypeptide, Ascorbic Acid Polypeptide, Pantothenic Acid Polypeptide, Papain, Bromelain, Melanin, Melanin Silanetriol, Wheat Amino Acids, Hydrolyzed Wheat Protein, Hydrolyzed Soy Protein, Hydrolyzed Oats, Hydrolyzed Vegetable Protein PG-Propoyl Silanetriol, Tocopheryl Acetate, Guar Hydroxypropyltrimonium Chloride, Cinnamidopropyltrimonium Chloride, Polyquaternium-10, Polyquaternium-7 Dihydroxypropyl PEG-5 Linoleammonium Chloride, C11-15 Pareth-7, Laureth 9, Trideceth-12, C12-13 Pareth-23, C12-13 Pareth-3, Glycerin, Propylene Gycol, Citric Acid, Butylene Glycol, Aminomethyl Propanol, Acrylates Copolymer, Parfum/ Fragrance, Methylchloroisothiazolinone, Methylisothiazolinone, Methylparaben, Propylparaben, Geraniol, Hexyl Cinnamic Aldehyde, Linalool, Limonene. Conditioner: Aqua/Water/EAU, Cetearyl Alcohol, Cyclopentasiloxane, Cetrimonium Chloride, Stearyl Alcohol, Behentrimonium Methosulfate, Cetyl Alcohol, Dimethiconol, Wasabia Japonica Root Extract, Foeniculum Vulgare (Fennel) Seed Extract, Chondrus Crispus (Carrageenan) Extract, Hydrolyzed Algae Extract, Algae Extract, Caviar Extract, Linum Usitatissimum (Linseed) Seed Oil, Butyrospermum Parkii (Shea Butter), Helianthus Annuus (Sunflower) Seed Extract, Saccharomyces Lysate Ferment, Saccharomyces Copper Ferment, Saccharomyces Zinc Ferment, Superoxide Dismutase, Lactoferrin, Daucus Carota Sativa (Carrot) Root Extract, Retinyl Palmitate, Phospholipids, Corn Oligosaccharides, Copper Lysl Oxidase, Acetyl Methionine, Acetyl Serine, Amino Acyl tRNA Synthetase, Phytosphingosine, Ganoderma Lucidum (Mushroom) Tyrosinase, Lentinus Edodes Tyrosinase, Glycine Soja (Soybean) Seed Peroxidase, Peptone, Hydrolyzed Soy Protein, Glycine Max (Soybean) Symbiosome Lysate, Pikea Robusta Extract, Adenosine Triphosphate, Niacinamide Polypeptide, Ascorbic Acid Polypeptide, Pantothenic Acid Polypeptide, Papain, Bromelain, Melanin, Melanin Silanetriol, Hydrolyzed Oat Protein, Hydrolyzed Vegetable Protein PG-Propoyl Silanetriol, Divinyldimethicone/Dimethicone Copolymer, Hydroxyethylcellulose, Cinnamidopropyltrimonium Chloride, Jojoba Esters, Tocopheryl Acetate, Cetrimonium Bromide, Glycereth-26, Glycerin, Butylene Glycol, Propylene Glycol, Propylene Glycol Dicaprylate Dicaprate, PPG-1 Trideceth-6, Polyquaternium-37, Polyquaternium-10, Amodimethicone, C11-15 Pareth-7, C12-13 Pareth-23, C12-13 Pareth-3, Laureth-9, Trideceth-12, Glycerin, Citric Acid, Methylchloroisothiazolinone, Methylisothiazolinone, Methylparaben, Parfum/ Fragrance, Geraniol, Hexyl Cinnamic Aldehyde, Linalool, Limonene. Overnight Hair Rescue: Water/Aqua/EAU; Cyclopentasiloxane; Dimethicone; Polyquaternium-37; Glycerin; Propylene Glycol Dicaprylate/Dicaprate; Phenoxyethanol; C10-40; Isoalkylamidopropylethyldimonium Ethosulfate; Caprylyl Glycol; Dipropylene Glycol; Dimethiconol; PPG-1 Trideceth-6; Fragrance (Parfum);Trimethylsiloxyamodimethicone; Butyrospermum Parkii (Shea) Butter; C12-16 Pareth-9; Hydrogenated Castor Oil/Sebacic Acid Copolymer; C11-15 Pareth-7; Trideceth-12; Hydrolyzed Wheat Protein PG-Propyl Silanetriol; Panthenyl Ethyl Ether; Phytantriol; Wasabia Japonica Root Extract; Keratin Amino Acids; Sodium Chloride; Hydrolyzed Algae Extract; Keratin; Hydrolyzed Soy Protein; Superoxide Dismutase; Hydrolyzed Keratin; Foeniculum Vulgare (Fennel) Seed Extract; Pikea Robusta Extract; Polyquaternium-10; Silanetriol Melaninate; Bromelain; Caviar Extract; Glycine Max (Soybean) Symbiosome Extract; Papain; Saccharomyces Lysate Extract; Saccharomyces/Zinc Ferment; Algae Extract; Adenosine Triphosphate; Hexapeptide-11; Lactoferrin; Niacinamide/Yeast Polypeptide; Phospholipids; Phytosphingosine; Corn Oligosaccharides; Saccharomyces/Copper Ferment; Daucus Carota Sativa (Carrot) Root Extract; Ganoderma Lucidum (Mushroom) Tyrosinase; Lentinus Edodes Tyrosinase; Retinyl Palmitate; Acetyl Methionine; Acetyl Serine; Amino Acyl tRNA Synthetase; Copper Lysl Oxidase; Glycine Soja (Soybean) Seed Peroxidase; Ascorbic Acid Polypeptide; Pantothenic Acid Polypeptide; Hydrolyzed Algae Extract; Geraniol; Hexyl Cinnamal; Limonene; Linalool. Hair Spray: SD Alcohol 40-B, Hydrofluorocarbon 152a, Octylacrylamide/Acrylates/Butylaminoethyl Methacrylate Copolymer, Cyclomethicone, Aminomethyl Propanol, Phenyl Trimethicone, Triethyl Citrate, PEG/PPG-17/18 Dimethicone, Pentaerythrityl Tetracaprylate/Tetracaprate, Panthenol, PPG-5 Ceteth-20, PPG-2 Myristyl Ether Propionate, Propylene Glycol, Caviar Extract, Aqua/Water/EAU, Hydrolyzed Soy Protein, Glycine Max (Soybean) Symbrosome Lysate, Fennel (Foeniculum Vulgare) Extract, Pikea Robusta Extract, Saccharomyces(Lysate,Copper,Zinc )Ferment, Superoxide Dismutase, Lactoferrin, Adenosine Triphosphate, Retinyl Palmitate Polypeptide, Niacinnamide Polypeptide, Ascorbic Acid Polypeptide, Pantothenic Acid Polypeptide, Phospholipids, Corn Oligosaccharides, Copper Oxidase, Acetyl Methionine,, Acetyl Serine, Amino Acyl tRNA Synthtase, Magnesium Sulfate, Peptone, Fragrance/Parfum. I am 65 and hair is thinning and dry. This product helps maintain shine and elasticity. I love this stuff. I don't use it every day b/c i like to alternate shampoos. 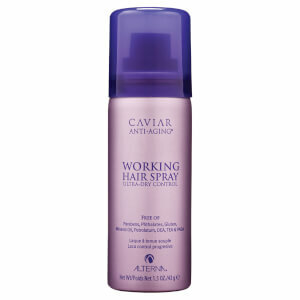 when i want a really great hair day this is what I use!!! 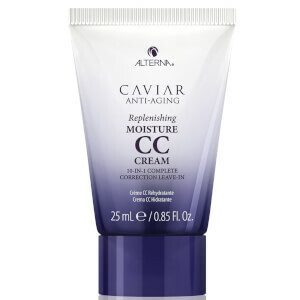 Love the products, so this was a no-brainer to get the ALTERNA Caviar Travel kit: sold on the shampoo, conditioner, hair rescue, looking forward to using the hair spray for the first time!SIlver BAG is great and durable for continued use.